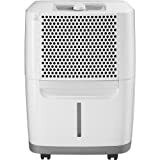 Frigidaire - FAD301NWD: Dehumidifier Review • The Air Geeks, reviews of air conditioners, dehumidifiers and air purifiers. 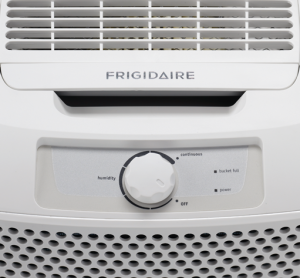 The Frigidaire FAD301NWD is a compact humidity control system that is suitable for relatively small rooms. It pulls up to 30 pints of moisture from the air in 24 hours This lightweight unit effectively controls the relative humidity of a room to give it a comfortable environment. Is the relative humidity of your room higher than it should be? If you have noticed presence of mold and mildew in your house, then chances are high that its relative humidity is higher than it should be. Excess moisture also tends to attract bacteria that can cause itchiness and difficulties in breathing. Considering that you could be weighing options on which dehumidifier to purchase, we have gathered all the information that you need to know about the FAD301NWD. Without further ado… let’s dive in! The FAD301NWD is a light weight humidity control system that allows the user to set a desired level between 35% and 85%. With a capacity of 30 pints per day, this dehumidifier is suitable for relatively small spaces. It eliminates excess moisture to ensure that your room is free from mustiness. It also helps to ensure that your valuables are not destroyed by excess moisture. Apart from damaging household possessions, excess moisture can cause your house to have a bad smell. The FAD301NWD features a filter than ensures that the air blown into your room is dry and odorless. In addition, this unit filters away bacteria to provide your room with clean air. High relative humidity favors the growth of mold and mildew. This dehumidifier lowers the moisture level to create a dry environment that is unfavorable for their existence. The FAD301NWD features a front 12-pint reservoir for holding the water that it captures from the air. For high humidity environments, this unit can fill this reservoir in seven to ten hours. This means that the user may need to empty the tank two or three times in a day. It is therefore recommended to position the unit close to a suitable drain. What happens when the reservoir is full? The FAD301NWD offers an alert system that notifies the user when the tank is full. If the reservoir is not emptied immediately, the unit shuts off to prevent water spillage on the floor. Frigidaire tanks are easy to empty! 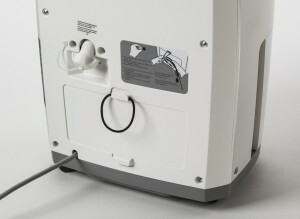 For convenience, you can use a hose to connect the unit to an external sink. This approach is convenient but the dehumidifier must be positioned in such a way that the collected water goes to the sink by using gravity. This can be achieved by securing it on top of a table. Is this dehumidifier noisy? Like most appliances that have a compressor and a fan, this unit produces sound. If it is placed next to a TV, you may need to increase the volume to mask the sound that it produces. However, this unit does not produce annoying sound and it is quieter than air conditioning window units. The FAD301NWD is an energy star rated dehumidifier that is optimized to consume minimum energy. Nevertheless, we have observed that this unit dissipates heat and can cause the temperature to rise slightly. However, compared to earlier models, this unit has higher efficiency and produces less heat : at the Air Geeks, we like brands that keep on improving on their older models. In case you are looking for a unit that you can easily move from one position to another, then the FAD301NWD is a suitable choice. This unit features caster wheels that enable users to push it from one room to another with ease. To enhance portability, it also features a top handle and side handles – always nice to install it, move it and remove when you don’t need the item any more. Effective dehumidification. This unit effectively pulls the moisture to make your room dry and free from mold, mildew, bacteria, and airborne particles to mention a few. However, it is only suitable for small bedrooms, offices, boats, and so on. Easy to set up and use. You can set up this unit within minutes. In addition, it is easy to use its controls. Noisy unit. After comparing this dehumidifier with other units that have same capacity, we noted that it was noisier than most of them. Short lifetime. We have noted that the number of failures reported for this unit is high. Some failed after weeks of use whereas other developed problems after running for months. The 41-year-old Westinghouse dehumidifier in my basement finally gave up the ghost early this summer. Because it was already very humid, I was desperate to get a new one ASAP. Apparently, so was everyone else in New England because I couldn't find a good one in the stores. Most had already sold out and the few that were left were brands with bad reputations for recalls, overheating, etc. Based on reviews and word of mouth, I really wanted a Frigidaire. I should have ordered one online right away instead of trying to find one locally. Fortunately, I only had to wait a few days after I ordered, and it was worth the wait. I put the Frigidaire on a sturdy table and hooked up a short hose to the outlet on the back of the unit. I put the other end of the hose in a nearby washtub and didn't have to wait very long for water to start trickling out of the hose. Before I ordered the Frigidaire, I had tried another type of dehumidifier that uses thermoelectric/Peltier technology. The most moisture it could collect was two ounces in eight hours. I knew that wasn't enough, especially for what I had paid for it. In contrast, on a really humid day, the Frigidaire can collect a few ounces in just an hour. And since it's going into the sink, I don't ever have to empty a bucket. As for the noise - it may depend on your point of reference. My 41-year-old Westinghouse was quieter, but it was also less efficient and less powerful. On the other hand, all of my air conditioners are window units, and they're louder than the dehumidifier, especially when the compressor in the air conditioner cycles on and off. I WISH they sounded like the dehumidifier."" I bought this dehumidifier because I was having trouble keeping my garage moisture-free in rainy South Florida. Mold and mildew were becoming a problem and I was reluctant to store anything there, to say nothing of the unpleasant musty odors that were attaching themselves to my luggage and things like that. This dehumidifier isn't huge, but it sure does the trick. The design is great. It has wheels and a recessed handle that slides out for easy portability. There's a dial so that you can set the unit to turn on when it reaches your desired level of dryness, or you can set it to remain on constantly. I keep mine set about halfway and that seems to be enough for my space, and doesn't seem to use much electricity. The dial is relative and not digital, so you can't set to a particular numerical value. The unit turns on and off as necessary, and when the water container is full, the unit stops and a light goes on. 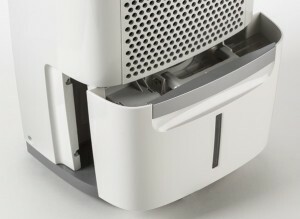 There's also a thin vertical window on the reservoir with a floater so you can see how close to full the unit is. When it's full (or whenever you like), the bottom portion slides out of the front of the machine and itself has a handle so that you can dump out the water--kind of heavy when full, though. It's not the quietest of machines--kind of sounds like a small fan or air conditioner when operating, but that wasn't a problem for my needs. If you need silence, then you probably need to go chemical with a DampRid or something like that. The cord is a decent length, and there's a built-in elastic retainer on the back for easy cord storage. In short, I'm glad I bought this. No more mold in my garage, and it smells fresh and clean in there all the time." This compact and lightweight unit draws excess moisture from the air at an impressive rate. However, it is only effective when used in a relatively small room. In addition, it consumes minimum power and dissipates little amounts of heat. Despite its high effectiveness, our tests reveals that the unit is a noisier that most units of same capacity. Users also reported several cases of failures – sturdiness being one of our chief concerns at The Air Geeks, you know that this is not a good sign for us. However, the low price makes up for it to some extent. In case you have a small room and you are looking for a humidity control system, then the FAD301NWD could be a good solution for you. You just need $170 to get this dehumidifier that will transform the environment of your room to make it free from bad smell, mold, mildew, and mustiness.